With his reboot of the Star Trek film series, international filmmaker of mystery J.J. Abrams managed to make the property viable again from a commercial sense, bringing in the mainstream audience that had been fleeing from the film series while also offering some interesting creative potential. Going back to the formative days of James Kirk and the valiant crew of the starship Enterprise but along an altered timeline from the one familiar to longtime fans of the franchise offered the possibility of revisiting some of the classic characters, places and stories from the original TV show but pushing them into different directions. For a good portion of its running time, it seems that Star Trek Into Darkness has set just such a course, cutting Kirk (Chris Pine), Spock (Zachary Quinto), and their shipmates adrift in a galaxy where morals aren’t clear-cut and where assumptions about duty are called into into question. 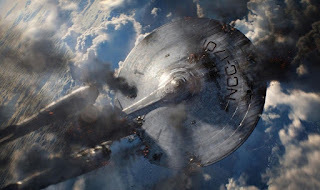 Although nearly derailed by the need of Abrams and his creative team to replay some of the most hallowed bits of the established canon, the end results are sufficiently exciting and entertaining to keep this iteration of Star Trek aloft. The latest threat our colorfully-uniformed heroes face is renegade Starfleet operative John Harrison (Benedict Cumberbatch), who declares his own private little war against the Federation by launching several violent attacks against Starfleet. Kirk’s natural reaction is to track him down and wipe him out, no matter the risk to the peace and safety of the galaxy or the objections of his officers. But the quest to bring down Harrison will force the Enterprise gang to question their ideals and challenge Kirk to weigh his greater responsibilities against his desire for justice. There’s been a raging debate among Star Trek fandom about the direction of Abrams’ new series and its tendency to forsake the harder science fiction elements of the Star Trek mythos in favor of action and adventure, a choice that seems to please mainstream audiences while alienating some of the fans. While I understand and share the desire to see Star Trek go back to exploring strange new worlds, one has to accept that any particular version of an established property, whether it's Batman, Snow White or Star Trek, is going to represent the different inclinations of the creative minds behind it. Star Trek in particular, having existed for as long as it has, is going to represent many different things to different people. For Abrams, thus far it's interstellar conflict and the effects it has on the Enterprise crew that excite him most, though a subplot involving a rising militarism in Starfleet and the objections of our heroes to it suggest an awareness on Abrams' part that his trend may not quite fit Star Trek, perhaps indicating this entry is meant to be his final point on it. That said, the focus on action is something that actually started before Abrams, with big starship battles, fisticuffs and menacing villains being the focus of the film series for some time and having its lineage in some episodes of the original series. What Abrams has done is to present it on a scale the series hasn’t had the ability to depict for some time and he continues to be successful in making it compelling. 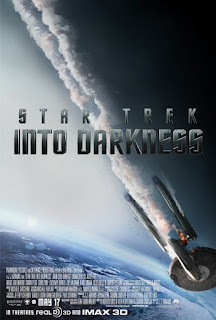 Into Darkness puts our heroes into even more desperate situations than they faced in the last film and the resulting story has a real sense of jeopardy with large-scale ramifications to the choices Kirk and his crew must make in their mission. We also get to see our beloved starship do few things she’s never had the opportunity to do before and get pushed to her limits as much as its crew. 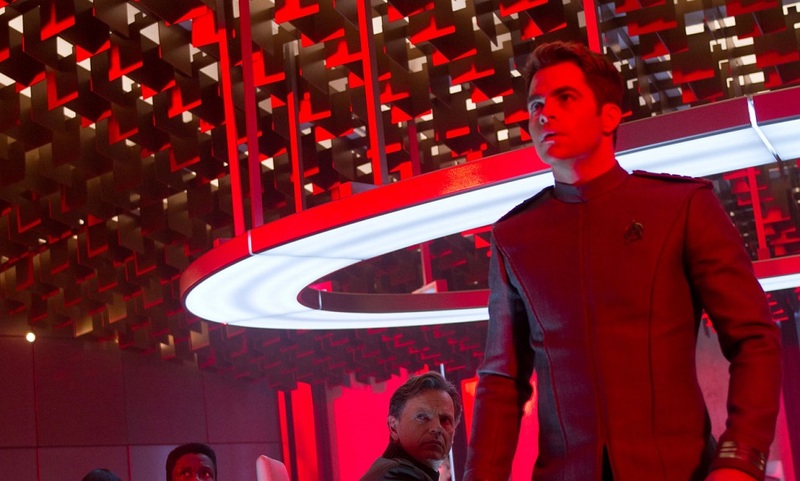 Both of Abrams' Trek films have a distinct flavor of moral uncertainty and political tension in the shadow of violence that is distinctly post-9/11 and something we've seen underpinning other blockbuster fare. While the previous film showed the emotional impact of a catastrophic terrorist attack, here we focus on what naturally follows, the military response and the quest for justice. The film's biggest weakness, one that becomes more apparent as the story warps into its third act, are the homages to some of the seminal moments of Trek lore. A few of them actually serve the story and its themes in theory and would probably work better if their presentation wasn’t so slavish to their original version. Instead, they force unfavorable comparisons to those classic scenes, rendering them dim echoes that rip us out of the narrative and remind us there are some things that only Shatner and Nimoy can really pull off. There has also been a lot of debate about perceived plot holes and while I think most of these are pretty well covered by the script, I can’t deny some are definitely there. Look hard enough and you'll find them in any film. Hell, Iron Man 3 is full of them. I guess it’s a pretty good indicator of whether a film’s working for you since if it is, you won’t be bothered by them or are content to explain them away on your own terms. The strongest thru-line of the film seems to be the humbling of Kirk and a deconstruction of the character as he has been classically portrayed. As the film opens, Kirk has pretty much become the impetuous captain we know from the original series; brash, womanizing, always ready for a fight and self-confident to the point of arrogance, he’s a leader willing to take big gambles with his crew and is content to disregard the rules whenever they become inconvenient. In this rebooted universe however, Kirk and the audience are quickly reminded that things have changed. We get several scenes showing that Kirk's bravado, intuition and even his skills in a fistfight are woefully insufficient to get him through this emergency and that his arrogance and lack of reverence for his responsibilities may actually make him a liability to the crew he has grown close to. Kirk can no longer leap into a situation, shake things up and beam back onto his starship to without consequences, a modus operandi epitomized by the opening scene in which we watch him blatantly violate the Federation’s non-interference rule regarding alien civilizations in an effort to rescue a crew member, an act that seems less a matter of concern than of ego. In this universe there are consequences, as he is removed from the captain’s chair of his beloved ship, something we almost should have expected at some point during the original series. 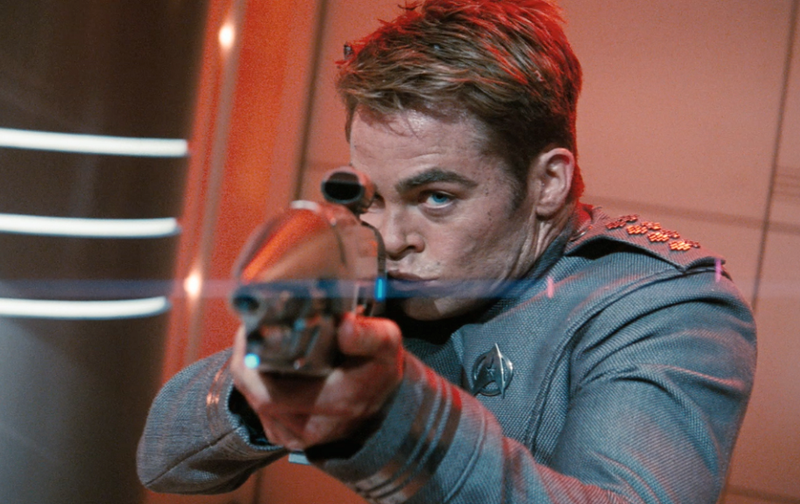 But as the film proceeds, we see Kirk’s character arc isn’t as going to be as simple as him learning to abide by regulations as he will face situations where following orders isn't necessarily the right thing either. His true challenge is to look beyond himself and his whims and impulses to take in the bigger picture, a journey that gives Pine the chance to move beyond the maverick charm he's brought to the role thus far to show Kirk wrestling with the unfamiliar sensation of failure. As he discovers how far his mentor Admiral Pike (Bruce Greenwood) has gone to defend him with his Starfleet superiors, a blindsided Kirk’s uncharacteristically inarticulate gratitude is easily Pine's best scene in the role to date. Kirk’s focus on protecting his crew finds a parallel in Harrison, who becomes the dark extremity of Kirk’s sins. Like Kirk, he views himself as beyond the rules and is focused on avenging perceived wrongs or doing what he feels best serves his own people, no matter the larger consequences. The primary focus of speculation regarding the film has been on what Cumberbatch’s villainous character is all about and while I’ll save that for the spoiler section, it should come as no surprise at all that he is one of the film’s strongest assets. Best known in the title role on the BBC series Sherlock, he meshes the keen intelligence he radiates in that role with ruthless charisma and convincing physical menace to create a dangerously improvisational adversary, instantly and effortlessly able to flick the switch from calculating stillness to savage fury. Meanwhile Spock’s journey of dealing with his suppressed emotions continues. Whereas last time we saw Spock drawing on those emotions, something Kirk certainly knows something about, here we find him making a deliberate choice to keep them in check, a trait that can alienate him from others, notably his frustrated girlfriend Lieutenant Uhura (Zoe Saldana), but which often gives him a cooler insight into situations. With his sometimes crippling adherence to the letter of the law and his inability to deceive, he is still Kirk’s opposite even while serving as his conscience. One thing Abrams has gotten very right about these characters is the way their differences bring out the best in each other. Despite the often grim situations, Quinto is able to inject an understated (he is Vulcan after all) humor and amusement to Spock's interactions with others. As for the rest of the Enterprise crew, everyone gets some key moments to shine. 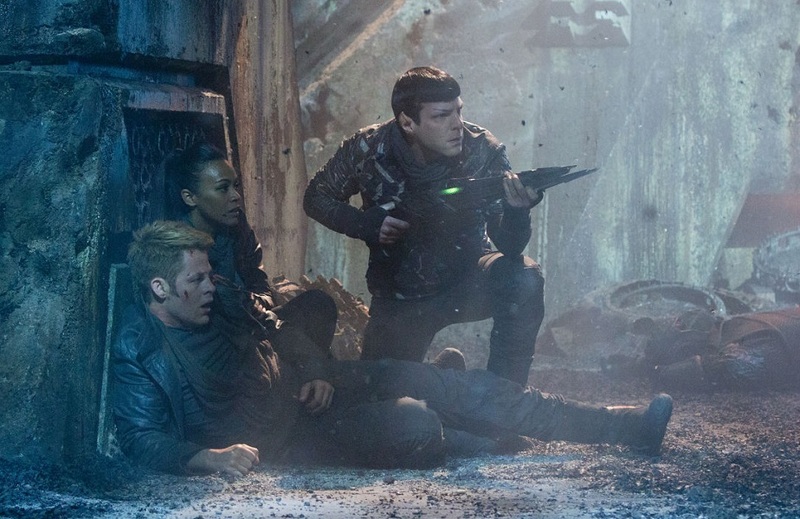 Karl Urban is as great as ever as the ornery Dr. McCoy, John Cho shows us a steely side of Sulu as he deals with his first taste of command, and Anton Yelchin has some stressed-out fun as Chekhov wrestles with a malfunctioning ship. The best character development for the supporting cast goes to Scotty and Uhura. Simon Pegg gets to play more than just comic relief as the ship’s ever-reliable engineer finds himself at odds with Kirk over the safety of their mission. After merely being the love interest last time, Saldana thankfully gets a better chance to show Uhura’s courage, cool-headedness and resourcefulness and makes her complicated relationship with Spock count for more than just chuckles. It’s always good to see Peter Weller, cast here as the head of Starfleet, on the big screen and Noel Clarke, a long way from defending the Earth from Cybermen, adds an air of tragic resignation as a Fleet officer recruited into Harrison’s schemes. Greenwood brings sage warmth to his welcome return appearance as Admiral Pike. Unfortunately, Alice Eve, as a Starfleet weapons officer assigned to the Enterprise, is less of a character than a plot point and is stuck with one of the film’s clumsiest scenes, in which she strips down to her underwear for no apparent reason other than allowing Kirk (and the men in the audience) to ogle her. Special praise must go to Michael Giacchino, who is quickly becoming the preeminent film composer of the decade with his amazing work on The Incredibles, Up, John Carter, and Super 8 among others. His heroic main theme is distinctive, exciting and highly adaptable and he builds on it here, creating driving music for the action moments and quietly moving themes for Spock and ominous cues for Harrison. The finale suggests that Abrams' take on Star Trek may be closing the hatch on villain-motivated plots and destruction to focus more on exploration and discovery, aspects of the franchise that many, including the characters in the film, have expressed a longing to return to. I do hope that's the case, but for now I'm content to enjoy the fun that Into Darkness offers, despite it boldly and loudly going where Star Trek has already gone before. Ok, SPOILER time as it's virtually impossible to examine the film, its potential and its flaws in depth without giving away some of the plot elements that Abrams has been eager to keep secret. Only scroll on down if you've already seen the film or have no problems with having aspects of the plot and its ending revealed. There will be additional blank space to ensure you don't see anything you don't want to in case you just want to go leave a comment. 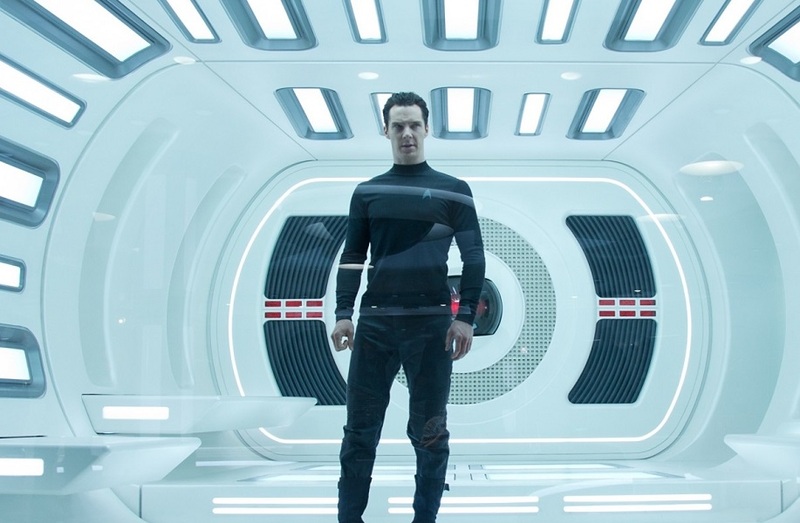 Ok, so now it's time to talk about Cumberbatch. The months of speculation and rumor have turned out to be true. He is in fact Khan... and yes it took everything I had not to type that in large capital letters with many exclamation points. Star Trek's most famous villain, the notorious Khan was a genocidal conqueror of the (now invalid) 20th century Eugenics Wars who escaped Earth with a group of his followers on a sleeper ship. I did feel pangs of disappointment they decided to go this route, partially because there has been so much speculation regarding it, the reveal was almost anti-climactic, a hazard in the Internet age when it began to leak out before a frame of footage had been shot. I appear to be one of the few who appreciates Abrams' efforts to keep his films concealed and preserve a sense of surprise for audiences. The other bit of disappointment came from a more selfish source; I had hoped he'd turn out to be Gary Mitchell or even possibly a grimer take on Gary Seven. That said, the direction the script takes Khan for the second act is interesting: Kirk and Khan reluctantly team up to stop the film's other villain, Weller's Admiral Marcus, who had attempted to use Khan's vicious tendencies and intelligence to realize his vision of a militarized Starfleet and fight what he feels is an inevitable war against the Klingons. There's also the fun irony that the story has a vengeful Kirk chasing Khan around, an inversion of the dynamic they've had in the past. The possibility of Khan being rethought as an anti-hero rather than an outright villain is really fun, although the vast potential to the concept does get tossed aside by the third act, when Khan starts acting like the power-mad conqueror we know him to be. While this is undeniably true to the character, after the fact I found myself reflecting on how more amazing it would have been if Khan kept down the path the film sets him on. Early on we see his emotional reaction to his belief that Marcus had executed his crew and I thought for a time the movie was setting us up to have Khan sacrifice himself to save them and have Kirk learn from Khan's example, a situation which also would have been a real turnaround from their original antagonistic relationship. There have been complaints that Khan has merely been shoehorned into the plot and I have to disagree. The fact that Khan is so much more savage than the citizens of the Federation, part of the reason Marcus has been so eager to use him, has some relevance to the political allegory of the film, in which a superpower uses a supposedly less civilized asset to get its dirty work done but is somehow surprised when that asset pursues its own goals, a scenario that has many real-world examples. Khan's megalomania and self-righteous belief that he can bring order to humanity also points up Kirk's character growth and even Marcus' agenda. All three men are willing to break or bend the rules and disobey laws to follow their own conception of morality and what's allegedly best for their people when it's really about feeding their ego. It is only Kirk that is able to move beyond acting based on what best serves him when he chooses to sacrifice himself to give his crew the chance to survive. This plot point serves his character development, but the realization of it, with Kirk exposed to radiation and ending up separated from his first officer by a pane of glass, is of course a direct replay of the end of Star Trek II and merely flipping which character is where does not alleviate that. This is aggravated by Spock crying out Khan's name to the heavens, a moment immortalized by Shatner in that previous film and now the subject of so much parody that try as he can, Quinto can't make us take it seriously. I also do want to deal with one alleged plot hole that many have brought up. Following Kirk's death, McCoy realizes that Khan's blood, which has been previously revealed to have regenerative powers that give him his augmented endurance and strength, may be able to bring Kirk back and he urges a revenge-minded Spock to bring Khan back alive. Many have suggested this makes no sense since the rest of Khan's crew, also genetically superior, are all aboard the Enterprise in cryotubes, one of which McCoy opens to put Kirk in for preservation. This does however assume that all of them have the same abilities that Khan does. Considering he is the leader, it stands to reason he's the most powerful of them and even the original episode that introduced him, "Space Seed," showed that his underlings were easily overpowered in comparison to him. One last fun note. 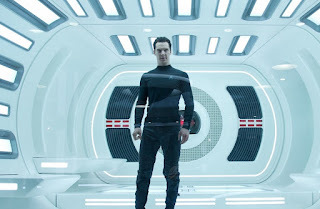 Many of the commercials and trailers have featured Khan boasting that he will have his vengeance. When we finally discover Marcus' ultimate weapon, a massive dreadnought-class starship that Khan designed and gains control of, what is it called but the Vengeance; a nice bit of plot-twisting wordplay worthy of Steven Moffat. Tim, couldn't agree with you more on so many points. First, like you said, it felt like some scenes were merely shoehorned into the script in order to bring that remembrance of the originals. Some to the point where you are expecting a particular scene the entire time, and when it finally shows up, you get more chills of "ok, we got it.." rather than "awesome!" While some of them work in passing shots, (hey look, a tribble!) others were painfully forced. The Alice Eve scene was hilarious. As a guy sitting the audience, I was embarrassed that they felt the need to put that scene in to try and capture our attention. It reminded me of the scene in the insta-classic Deep Blue Sea where the main female character has to get out of her wet suit and stand on it for no reason other than "Hey, she's in her underwear!" I also loved Cumberbatch's performance. You felt this cold, intelligence in every line he spoke which made me uncomfortable, in a good way. I'd like to see them for the route of "exploratory" rather than constantly battling in a war, but I feel if he decided to go that way, the new audience Abrams has picked up with all for the action and adventure would rip the film apart and potentially kill the reboot. But alas, we shall see.